A number of players have busted during the level after dinner. They include Team PokerStars pro members Sandra Naujoks, Pieter de Jorver, and Fatima de Melo. Also hitting the rail were Justin Smith and Praz Bansi. Viktor Blom has climbed the leader board during the last level of play and he now paces the field with 132,000. Blom reached such lofty heights in a hand where the board read K 8 7 9 . David Weisberger bet 3,000 on the turn and Blom raised to 10,000. Weisberger made the call and the river fell Q . Weisberger checked and Blom fired a 40,000 mortar into the 25,000 pot. Weisberger would have to risk his tournament life to make the call and so he decided to fold. David Benyamine moved all in preflop and J.C. Tran and one other player made the call. The flop fell K 8 3 and Tran bet 4,200. The other live player made the call and the turn fell 8 . The two live players checked and the river brought the 4 . Both live players checked again and Benyamine flipped over pocket sixes. The live opponent of Tran revealed K J and induced J.C. to muck his hand. Benyamine was eliminated on the hand after charging out of the gates as one of the chip leaders early in the afternoon here. Naujoks was drawing dead after the turn brought no help and she promptly exited the tournament area. Tony Cousineau moved all in for 20,000 with a board of Q 7 3 6 sitting on the table and Ludovic Lacay made the call. Cousineau turned over A Q and Lacay held pocket eights. The turn and river blanked out and Cousineau held 65,000 after the hand. Wigg doubled up on the hand and Elezra took the minor hit in stride. Picking up the action on the turn, a player moved in for his last 6,000. The board read 9 7 7 5 and Isaac Haxton made the call. Haxton had trips but his opponent had a full house and the river bricked with the 8 and Haxton was down to 5,500. Picking up the action after the board had run out 9 8 2 5 2 , Jamie Rosen bet 5,000. His opponent then moved all in for 9,675 and Rosen made the call. Rosen turned over A 10 for the nut-flush but his opponent had the real nuts, turning over 2 2 for quads. Rosen surrendered the pot and he was at 40,000. David Sklansky moved all in from the button and he was called by the player in the small blind. The board ran out 10 4 2 8 7 and Sklansky doubled up to 28,000. The player on the button raised to 1,200 and Sandra Naujoks made the call from the big blind. The flop then came down 9 6 2 and Naujoks checked. The button bet 2,100 and Naujoks made the call. The turn was the J and both players checked. The river was then the Q and Naujoks led out for 2,000. Her opponent made the call and Naujoks tabled 6 6 for middle set on the flop. Her opponent mucked and she scooped in the pot. She was up to 43,200. Unfortunately for her, she ran into a broadway straight a few hands later and she was back down to 23,500. Chris Moneymaker raised to 725 from under the gun and one player called.The big blind raised to 3,000 and both opponents called. The flop came down K 6 2 and the big blind led out for 4,000. Moneymaker was the only caller and the turn was the J . The big blind checked to Moneymaker and he fired 4,500. The big blind mucked and Moneymaker took the pot, improving to 46,500. After the flop came down Q 10 5 , Sandra Naujoks bet 2,500. Her opponent made the call and the turn brought the 5 . Her opponent checked and she fired 4,200. He called and the river was the 3 . Both players checked and Naujoks tabled K Q for top pair. Her opponent mucked and Naujoks took down the pot. She was at 105,000. Moneymaker had the lead but that changed when the flop fell K 8 8 . Moneymaker lost all hope of winning the hand when the turn brought the K to give his opponent a full house. The river was the J and Moneymaker lost the hand, dropping to 57,500 in chips. Esfandiari was racing but the flop was barren as it fell 5 5 2 . The turn was a different story as the A magically appeared to give Esfandiari the lead. The river was the 8 , securing the hand for Esfandiari and he doubled to 55,000. Matt Graham was heads-up on a flop of 10 7 2 . His opponent checked and he bet 3,200 and was called. The turn was the 8 and his opponent checked again. Graham bet 8,700 and his opponent check-raised to 21,000. Graham went into the tank and thought for a minute or so before making the call. The river was the A and Graham’s opponent led out for 32,000. Graham snap called and his opponent showed A 2 . Graham tabled 2 2 , good for a set and he took the pot. “That’s so sick,” said Graham. “I thought he showed me aces at first.” Graham is up to 140,000. After a raise of 2,500 from a player in late position, Tiffany Michelle moved all-in for her last 8,700. She was called and she tabled 2 2 and was up against the A 10 of her opponent. The board ran out A 3 4 6 Q , giving Michelle’s opponent a pair of aces and the pot. Michelle was eliminated late in day 2a. Michael Mizrachi saw his chips fluctuate quite a bit this level. We caught the action on the river with the board reading Q 9 2 Q 5 and there was a bet of 16,500 into Mizrachi. Mizrachi went into the tank for a minute or two before tossing in a call. Mizrachi mucked when he saw the J 10 . About 10 minutes later, Mizrachi was in a big pot and with already about 50,000 in the middle on the turn, the board read Q J 9 9 . Mizrachi’s opponent moved all-in for his last 50,000 and Mizrachi made the call. “I hope he has aces or kings,” said Mizrachi as he turned up A 9 . His opponent turned up 10 10 as the ESPN cameras ran over to catch the river card. The river card was the 5 and Mizrachi improved his stack to over 200,000. Picking up the action on the flop, the board read 7 6 4 . The player in seat 9 bet 5,200 and Sandra Naujoks made the call. The other two players in the hand mucked and the turn was the K .
Seat 9 led out with 7,300 and Naujoks made it 20,000 to go. Seat 9 tanked for awhile but then mucked his hand. Naujoks took in the pot and she was at 105,000. Picking up the action after the turn, the board read Q 9 4 6 . Maria Ho fired 3,000 and her opponent mucked. Ho took a small pot and she was at 36,000. The player in seat 5 raised to 1,600 and Antonio Esfandiari made the call from the button. The flop then came down Q 8 7 and seat 5 led out with 2,200. Esfandiari raised to 5,300 and that’s when the ESPN cameras showed up. “I guess I wouldn’t mind getting knocked out on camera,” seat 5 said. He moved all in for about 20,000 more. Esfandiari simply mucked his hand and he was at 80,000. Brian Hastings was in a heads-up pot and on the turn the board read A J 4 7 and a player checked over to Hastings, who bet 7,000. The player who checked, called the bet and they went to the turn, which was the 4 . There was another check and Hastings bet 15,000, which was called again. Hastings showed A Q and his opponent mucked. Hastings climbs to 92,000 after the pot. Erik Seidel raised from the cutoff and Greg Fishberg called from the small blind. The two saw a flop of K 3 9 and Fishberg checked and called a bet of 3,000 from Seidel. The turn was the 10 and Fishberg checked and called again, this time 9,500 from Seidel. The Q was the river and Seidel fired 20,000 and was snap-called by Fishberg. 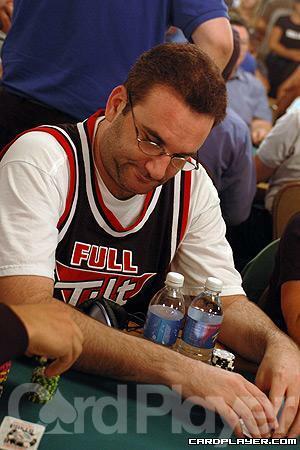 Seidel just had a disappointed look on his face as he didn’t turn over his cards. Fishberg showed J 10 and announced “straight,” which was good for the pot. Seidel falls to 17,000 and Fishberg is up to 88,000. Rob Saltiel was on the button and bet after his opponent checked on the turn with the board reading A 8 3 J . The player who checked then moved all-in and was called by Saltiel. Saltiel showed 8 8 , giving him a set, but his opponent showed J J , giving him a better set. Alas, the 8 fell on the river to give Saltiel the case eight to make quads and take the pot. Saltiel doubled up to 50,000. A player raised to 2,200 and was called by the cutoff, the button, and Lex Veldhuis in the small blind. The player in the big blind then squeezed and moved all-in for 17,100. It folded back around to Veldhuis who tossed in the call. Veldhuis showed 6 6 and he was off to the races against the A J . The flop came A 10 5 and Veldhuis was in a world of pain. The turn was the 7 and the river was the 8 and Veldhuis dropped to 42,000 in chips. Jonn Hennigan and his opponent checked down a board of 10 5 8 6 and on the river Q[[suit:river]] Hennigan’s opponent fired 7,100 into the pot. Johnny World threw his cards into the muck and was left with around 33,000 in chips. Reigning champ Joe Cada faced a raise of 2,100 by the player in seat 8. Cada wasted little time raising to 6,000 from the button. Cada easily had his opponent, and the two went into a coin flip. The flop was great for Cada, running 2 6 10 to give him a set. The A on the turn left his opponent drawing dead, and the J finished the board. Cada knocked out the player and chipped up to around 92,000 in chips. Brothers Michael and Robert Mizrachi are seated at tables 288 and table 289 in the blue section. The ESPN camera crews are planted between the two tables, but the Mizrachi’s are focused on their A-game. In one hand, Michael and the player in the big blind called a 2,100 raise from the player in seat 5. The flop ran 2 9 5 and action checked to the Grinder who bet 3,000. Everyone else folded and Michael chipped up to around 105,000. Robert is among the chip leaders with around 225,000. Baron flopped a set to crack the queens but the board finished off 10 and 8 to give his opponent the flush and Baron dropped to 33,000. A few hands later, Baron moved those 33,000 all in and was called by one player. Baron tabled 7 7 while his opponent tabled 4 4 . The board ran out 10 8 2 Q 2 and his pair held up. He doubled to 70,000. Daniel Negreanu raised to 4,600 preflop and he was called by a player in late position and then by one of the blinds. The flop came down Q 9 7 and Negreanu moved all in for about 15,000. Neither of his opponents looked him up and Negreanu took the pot uncontested. He was up to 30,000. Robert Mizrachi raised to 4,400 from the cutoff and the player on the button made the call. The flop came down Q 8 2 and Mizrachi bet 5,500. The button called and the turn was the 2 . Both players checked and the river was the 7 . Mizrachi fired 14,600 and his opponent made the call. Mizrachi tabled 7 7 for a rivered boat and his opponent mucked. Mizrachi was at 414,000. We didn’t catch all of the action but Vanessa Rousso moved all in for about 15,000 and was called by one player. Rousso tabled A-6 and her opponent had K-J. The board ran out seven-high and Rousso doubled up to 30,000. Allyn Jaffrey Shulman was all-in with A 10 against her opponent’s A K . The ESPN crew rushed over to film the hand as the board ran out 7 4 3 K Q .
Shulman was eliminated and ESPN filmed her husband, Barry, consoling her after her chips were pushed in the other direction. Kelly Kim raised to 3,800 and was met with a three-bet to 10,700 by Phil Galfond. Kim moved all-in for around 35,000 and was snap-called by Galfond. Galfond showed A A and Kim showed J J . Galfond was in good shape until the dealer peeled off the J in the window. The other two flop cards were the 8 and the 6 and now Galfond was the one in trouble. The turn was the 5 and the river was the K and Kim doubled up to 72,000. Sandra Naujoks fired 15,000 on the turn with the board reading 2 2 J 4 and was called by her opponent. The river was the K and and Naujoks moved all-in for 35,000 and her opponent beat her into the pot. Naujoks tabled A 8 , for a complete bluff and her opponent tabled A Q , giving him the nut flush and Naujoks was sent packing. Gabe Walls bet from late position and a player on the button three-bet him to 8,200. The action was back to Walls and he four-bet to 22,000. His opponent tanked before finally folding. Walls flashed a 2 and took the pot. He was at 364,000 after the hand. Kevin Bates made it 3,000 from under the gun and two players called. Action was on Jared Hamby on the button. He elected to shove for 36,200 total. Everyone folded and Hamby took the pot to increase his stack to about 46,000. A couple hands later, Steve Billirakis bet and was three-bet by a player directly to his left. Hamby moved all in on the button and it was folded to Billirakis. Billirakis announced all in and the three-bettor folded. Hamby exposed the A K while Billirakis tabled the J J . The board ran out 10 10 9 8 6 and Hamby was gone. Billirakis was up to about 180,000. Hamby had three cashes at the 2010 World Series of Poker. His best score was an eighth place finish in a $1,000 no-limit hold’em event for $46,077. On a board of Q Q J 10 action was checked to Vanessa Selbst in the cutoff. She fired out a bet of 23,500 and her opponent folded. Selbst was at 192,000 after the hand. Four players saw a flop of 10 8 7 and Noah Boeken bet 30,000 from the button. Mikael Thuritz raised to 118,000 and was all in. Nam Le and Allen Kessler each got out of the way but Boeken made the call. Boeken showed 8 8 while Thuritz held 10 8 . The turn was the 3 , harmless to Boeken. But the river was the 10 , giving Thuritz his miracle full house and the double up to 290,000. Boeken was hammered down to 90,000. A few hands later, Boeken was down to his last 60,000 and put it in preflop against Sam Stein. Boeken held A Q while Stein held 3 3 . The board ran out K 10 6 8 5 and Boeken doubled to 128,000. Picking up the action after a flop of 8 6 , Shawn Keller and Alexander Kuzmin got into it hard, eventually resulting in Keller having all of his chips in the middle. Keller was sitting pretty with Q Q while Kuzmin held A K . The turn was the 7 , offering no help to Kuzmin. But the K on the river gave Kuzmin the pot and sent Keller to the rail. Kuzmin was at 340,000. Clement Thumy raised to 13,000 from the hijack and Naujoks repotted to 36,000. Thumy put in another raise and Naujoks moved all in. Thumy called with A K .
Naujoks held Q Q and the board ran out 8 7 4 Q K and Naujoks doubled up with her set of queens. She was at 375,000 while Thumy was at 640,000. Note: Players are on a 60-minute break and will return at 8:20 p.m.
Sandra Naujoks put in a raise preflop and she was called by the player in seat 7. The flop came down K 6 5 and both players checked. The turn was the 7 and seat 7 checked. Naujoks bet 7,000 and seat 7 relased his hand. Naujoks took the pot and was at 112,000. Ashton Griffin raised to 4,900 from the cutoff and Shawn Keller made the call from the big blind. The flop came down 8 4 3 and Griffin bet 7,000 and Keller tanked. After a few moments to think, he raised to 21,000. Griffin then moved all in for 31,900 more. Keller thought a few more moments and mucked his hand, dropping his stack to 160,000. Griffin was up to 105,000 after the hand. Picking up the action after the turn, the board read Q 9 9 2 . Mike Matusow bet 8,000 and the player in seat 9 made the call. The player in seat 2 was also in the hand but folded to the bet. The river was the K and Matusow thought for a while. Eventually, he checked and seat 9 checked behind. Matusow just tapped the table lightly and seat 9 showed 7 7 for the winner. Matusow dropped the pot and was at 73,000. Picking up the action on the turn, the player in seat 2 bet 6,400 and Erica Schoenberg made the call. Two other players in the hand mucked and the river was the K .
The player in seat 2 counted out some chips and bet 12,600. Schoenberg thought for a few moments and then released her hand. She was at 70,000 after taking that slight hit to her stack. Picking up the action after the board had run out A 4 7 A 7 , David Ulliott fired a bet of 15,000 into the pot. The player in seat 9 took a session in the tank and eventually decided to muck. Ulliott raked in the pot and he was at 60,000. Unfortunately for Ulliott, he was eliminated later in the level. Sandra Naujoks raised to 4,000 from early position and the player in seat 8 made the call. Seat 3 also called from the big blind and the three players saw a flop of 8 5 4 . The action was checked to Naujoks who fired 12,000 into the pot. Both of her opponents quickly mucked and Naujoks took in the pot. Naujoks was at 40,000 after taking down that pot. Jason Lester raised to 4,800 from late position and J.J. Liu made the call from the big blind. The flop came down 10 8 2 and Liu checked. Lester bet 6,500 and Liu quickly released her hand. Lester took in the pot and he was 74,000 while Liu was down to 52,000. Gavin Smith’s opponent bet 3,000 and Smith made the call. The flop came 8 5 4 and Smith checked. His opponent bet 5,000 and Smith raised to 10,000. Smith’s opponent moved all in and Smith called with the A 8 and was up against the opened-end straight draw with the 6-3. The turn and river were safe for Smith and he advanced. Naujoks was all in with the A J versus the A K of Per Magnus Ummer. The board ran out 9 5 4 5 2 and Naujoks was eliminated. 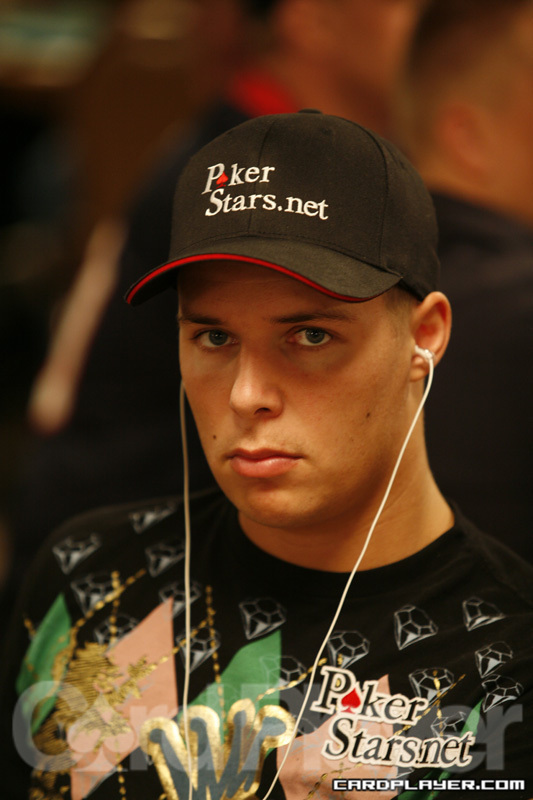 Tobias Reinkemeier opened for 45,000 and Sandra Naujoks shoved for 260,000. Reinkemeier called and showed pocket jacks. Naujoks was in trouble with A 9 and the board failed to help her come from behind when it rolled out K 9 5 3 5 . Naujoks was eliminated on the final table bubble and Reinkemeier took back the chip lead. William Molson raised to 32,000 and Sandra Naujoks called in the big blind. The flop came down Q J 6 and Molson continued with a bet of 42,000. Naujoks moved all in, covering her opponent, and Molson instantly called for his last 281,000, tabling A Q . Naujoks showed J 10 and needed help, but it never came when the turn and river fell 5 4 . Sandra Naujoks raised to 22,000 and Joe Cada moved all in from the big blind for his last 260,000. Naujoks called and turned over A 9 and Cada showed a dominated A 8 . The board fell A Q 5 2 3 and Naujok’s kicker played to send Cada to the rail. She now sits in second place with 650,000. Carter Phillips raised to 10,500 in middle position and James Calderaro reraised to 25,500. Sandra Naujoks then moved all in from the button for 150,000. Phillips then reraised all in to isolate, but Calderaro called as well. Naujoks showed pocket nines, Calderaro showed pocket kings and Phillips was praying for an ace with A K .
The board came J J 9 4 7 and Naujoks just about tripled up. Calderaro was eliminated and Phillips fell to 145,000. After the hand, Matt Marafioti informed the table that he folded 9 4 , so Naujoks actually hit a one-outer to survive and triple up. Calderaro earned $41,160 for his in the money finish. Sandra Naujoks raised preflop and Vivek Rajkumar made the call from the big blind. The flop came down 9 7 2 and Rajkumar bet 18,500. Naujoks called and the turn was the 3 . Rajkumar checked and Naujoks bet 28,000. Rajkumar called and the river was the 3 . Rajkumar checked and Naujoks moved all in for 89,500. Rajkumar tanked for a few minutes, calling out hands he could beat that fit Naujok’s line such as 6-5 and J-10. Eventually, he said, “I don’t think I can fold,” and made the call. Naujoks tapped the table, gathered her things and said, “nice hand,” as she flipped up A J . “What is going on here?” said Rajkumar. “So stupid, so stupid,” as he revealed a worse ace high with A 8 . Naujoks, who had left the table, had to be told that she had the best hand and didn’t seem to process the information even after she saw the cards. She eventually sat back down to 294,000 in chips while Rajkumar took a dip to 81,000. We don’t want to speculate on Rajkumar’s line of thought, but it appeared as though he felt Naujoks would check behind any better aces than his, simply because she had showdown value and that the only thing she could be shoving was air. Team PokerStars Pro Sandra Naujoks from Germany ran into a bit of bad luck during level four. Though she found herself all in and in a dominating position with pocket kings, her opponent’s A-J managed to spike an ace on the flop and put her in jeopardy. The turn and river were no help and she was sent to the rail in unceremonious fashion. Apparently, the players in this tournament don’t realize this is the main event. Despite 30,000 in starting chips and a relatively slow structure, the field is eliminating good chunks of itself at an alarming rate. The blinds haven’t kicked up much at all, yet players are finding ways to get it in with draws or even much less. Retired soccer (football) player Teddy Sheringham is in today’s field. The European superstar led Manchester United to a Champion’s League title and now he’s hunting for a poker trophy to add to his expansive display case. Just a few days ago, Sheringham finished in 14th place at the WSOP Europe main event and earned the respect of the poker community. He’s hoping his momentum continues and carries him deep once again. So far today, Sheringham is still sitting with his original starting stack.